This is one of my favorites stitches. I just started using this stitch a few months ago, and I love it. 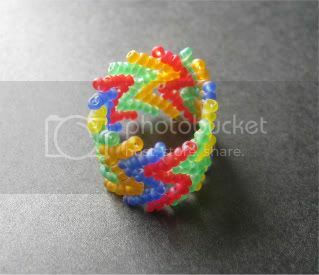 I love the ring you made, very cute. Thank you for this tuto, it's very clear ! I enjoy this stitch ! Thank you! I don't think I could live without this technique - it's definitely a favorite! Muchas gracias por el tutorial tan claro!!!!! thank you for this tutorial ! but how do finish the bracelet to put the clasp? excuse me for my bad english. I am french!! 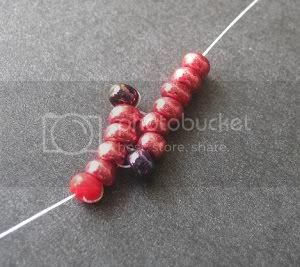 It might depend on the type of clasp you want to add, but the easiest way to finish the chain is to use the tails to make a seed bead loop - one at each end - with the threads crossing over. 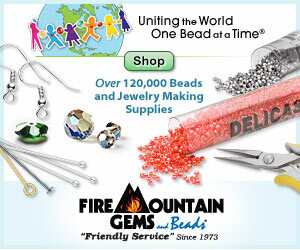 You can pick up your clasp with the seed beads, or add a jump ring to plain loops. Thank you very much, finally I got around teaching me that stitch which I always wanted to do but somewhat feared. I just love the looks though it's a bit hard on your hands and joints. But the outcome is so delicate and pretty. Thanks, Susanne! I'm glad I was able to help. 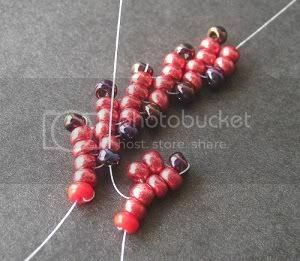 I remember that when I finally learned this stitch, it opened a whole new world of beading ideas. The ring is worked basically the same was as the second chain of St. Petersburg - adding new chains onto existing ones with shared beads. 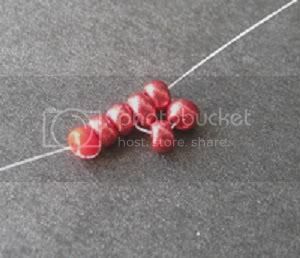 There are some minor differences in thread direction that help to get a smooth finish. I'll try to get a tutorial up for the technique! I am trying to print these instructions as I don't always like to bead in front of the computer, but only the pictures come up without the words ! What am I doing wrong ? There are a couple of things that you can try. First, make sure that you're viewing just a single post, not the entire blog. Go to File > Print Preview on your browser toolbar, to see how the print-out will appear. You can adjust the settings before printing if need be. You can also try using a different browser, which may give you different results. If all else fails, you are welcome to copy and past the images and text into a Word Processor and print the tutorial that way. Hope this helps! Great tutorial! I have just finished two lengths of double St Petersburg chain...how would you suggest that I join them and add a pendant? 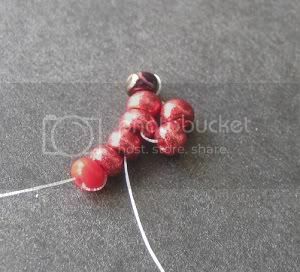 To make a V-shaped necklace for attaching a pendant, I will typically bring the 'start' ends of the two chains together, and use ladder stitch to lash the lowest, inner rows to each other. Once that's done, you can stitch directly onto the join, or suspend a focal from the bottom of the chains. The beadwork at the join can get pretty snug, especially if you're going over your stitches twice for durability. I recommend having a size 13 needle on hand if things get too tight. 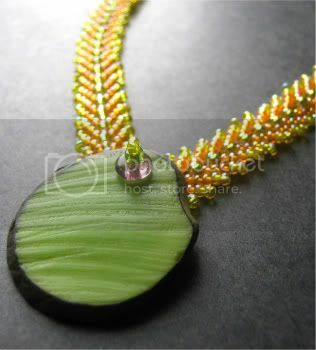 Would you email a photo of the back of the Tropical Fruit pendant so I can see how you attached the focal? I have been trying to understand tutorials for about a year! I just came across your site from pinterest! I got it ! Thank you you for your instructions I can hardly wait to finally try this stitch, St.Petersburg here I come. Yeah!!! Hi SaBrina! I'm so glad that you found the tutorial helpful. You're gonna have a blast with this stitch - it is really fun to weave and always looks gorgeous. Thank you for all these tutorials. I was slow getting here, but now that I have found you I am a permanent fan.